It is time for Rebar Jesus again. Welcome to a journey not to Second Life or OpenSim, but just down my street. I will not name the local church, but they set out a series of stick-figures, apparently made of welded metal rods, drape them in Biblical costume, and poke their pointy bits into the ground. The entire ensemble of Wise Men, shepherds, and proud parents flutter in the breeze to show the lines of the metal skeletons beneath. The manger, such as it is, looks like a soccer goal with a few 1x6” boards strapped across. It is not Scroogey of me to deplore this Yuletide atrocity to one of the world’s great monotheistic religions. My disdain comes not from a lack of Christmas Spirit: our house features window-lights that go up on Solstice night, the longest of the year, to remind us that the light will return. I pick a cedar and we cut ourselves each year, with my grandmother’s and great-grandmother’s ornaments placed lovingly there. put it up on Christmas Eve, the old-timey date for putting up a tree, and take it down on King’s Day, January 6, when the Melchoir, Balthazar, and Caspar laid their gifts before the baby Jesus. I am fond of the old customs, some from times before Christianity: we even walk outside to wassail our fig tree, then come inside by the fireplace to watch the Charlie-Brown Christmas special, as we drink egg-nog and wish for peace. But there is no peace to be had from Richmond’s bad Nativity scenes. At one time, the cultural doyens of our city could rein in our excesses, so that homes, under the Spartan rigor of Williamsburg’s simplicity, featured only white lights, one to a window, and any excesses, such as real pineapples, were placed in the wreath on the front door or kept entirely out of sight. Has the reader ever spotted a dancing Santa or string of red “tube lights” along Duke of Gloucester Street? No. If such a thing were to rear its ugly head, some matron whose family went back to Jamestown would rip it down and have a man in Colonial garb burn it up in a cresset. Now, in these fallen and consumerist times, the Misses Propriety and Prudence Decorums of Richmond are long gone, and look what has happened. Just down the street from the Rebar Holy Family who could not find shelter at Home Depot, there is “Flatland Jesus” jig-sawed rather artfully from half-inch plywood and painted well. I almost like this one, until pass it in the car. At a ninety-degree angle, the parents of the Christians’ Savior of the World vanish. The church should have sprung for one-inch plywood, I guess. The phenomenon of terrible Nativity scenes has spawned a Web site, as all things awful do, featuring Star-Wars-Lego nativities, Peeps crèches, and Elvis mangers. 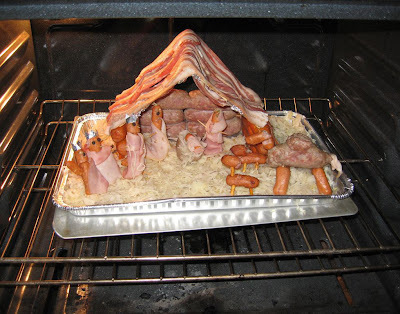 My favorite, pictured: all-meat Nativity with Jesus as a Vienna sausage. Click and you'll find that the rest are there, glittering in their foulness like the tree-lot full of abominations that Charlie and Linus navigate until they find a little green tree, still made out of wood, making Charlie realize “I think it needs me.” Christmas needs you, Richmonders of taste and restraint, to save it from your fellow citizens on the tacky-light tour. Slow down from your shopping and manic preparations, like Snoopy on Crack, to watch that TV classic again. Then act accordingly. Trust me. I know Christmas. I trod the boards in the role of Scrooge for our sixth-grade holiday play. * Other cities manage this. New York, that place of craziness at all seasons, puts on the dog, rather than looking like one, at Christmas. The nativities of Midtown, not to mention the live one in Radio City’s Christmas Spectacular this year, were magnificent in 2011. There was not a bobble-headed goat to be seen. And as for the long-legged Rockettes angels? Well, I’ll be good so I can go right to Heaven. Yet there’s one more tacky manger story to tell: my own. Under that big cedar we cut, I lay out my remnants of my parents’ Nativity scene. It was once nice, or should I say, they once were. The set consists of about ten different ensembles from several decades and in all sorts of scales. My late mother was rough on Christmas ornaments, including a clay Holy Family I picked up for her in Madrid. One of the Castilian shepherds is now missing his left hand, and when I went to adjust Jesus’ crooked halo last year, his neck cracked and his head fell right off. Thank God, in all His or Her names, for teaching humans how to make Gorilla Glue. The baby now rests peacefully in his little bed of Spanish straw, surrounded by old Woolworth’s plaster magi, a handmade sheep that I think comes from the late 1800s, plus a Major-Matt-Mason Astronaut and plastic Santa. Christ’s halo rolled under the corner of a large bookcase and I’ve yet to fish it out. But that child’s smile is still as divine, as if the little baby is laughing at our follies and our scurrying rush at Christmas. Someone far older and wiser is looking through those infant eyes. Come, and adore Him. So if a pink flamingo or cement lawn-gorilla ends up in you neighborhood’s Nativity scene, don't blame this Unitarian-Universalist. I have an alibi ready. *Scary Factoid: Novelist James Howard Kunstler was also a sixth-grade Scrooge. I wrote Jim about this, and he assures me I'm no Scrooge. But I'd bury every tacky-light contestant with a stake of holly through their hearts! Humbug!